An engineer through and through, he remains passionate, open minded and imaginative. He came to Vivid via his B&W connections, but with the original idea being “simply fitting OEM drivers in our own enclosures… I felt this would be no fun and if they were going to be serious that they should consider making their own drivers”, he told me. “It happened that in the years after leaving B&W, I had been developing a set of drivers which, while originally intended for use in high power studio monitors, were ideally suited to high-end domestic audio. The next four years were spent perfecting those drivers and developing the cabinet shapes. We quickly outgrew the garage where production started in 2004 and moved into our Durban factory in 2005, where we still manufacture all our enclosures and drivers from raw materials and machined parts. We’ve made about 2,700 loudspeakers to date”. He describes Vivid Audio, which was officially registered in 2004, as being “a design and engineering led company”, adding that, “the flow of ideas is very much in one direction – from designer to end user. To that extent the object which ends up in front of the listener is very pure. I feel a personal connection with each piece that ends up in a person’s listening room”. The first Vivid design, the B1, is a largish (1,095x265x375mm including integral stand) standmounter weighing a hefty 38kg each. It’s a three and a half way design, with two bass drivers being used, the one on the front baffle being directly coupled the second on the rear. This technology dramatically reduces the amount of mechanical energy given off by the enclosure, it’s claimed. To fully exploit this design, 3D solid modelling CAD software was used. “The precision of the models which result is almost magical. I make liberal use of spline curves which yield particularly smooth flowing results. The use of doubly curved surfaces increases the stiffness of the shell and this rigidity is further enhanced by the use of four lateral braces. Initially we used the external supplier to make the enclosures and an automotive body shop to finish them, but getting other folks to understand the importance of getting a flawless finish is really difficult, so in the end we brought it all in-house. So we now have complete control over every stage of manufacture”, he adds. Although much trouble has been taken to make the cabinet as acoustically inert as possible, Laurence is still a great believer of decoupling the drivers. “From earlier work on small sub-woofers I’d become convinced of the benefits of using pairs of opposing drivers in a reaction-cancelling configuration, so it was only logical that we use this approach on the B1”, he told me. But he couldn’t have the rear driver working up to 880Hz like the front, so it’s designed to start working at just 100Hz. “While this sorts out the acoustics, this means that the drive is no longer symmetrical so the reaction cancelling isn’t going to work above 100Hz. Fortunately it’s quite simple to decouple the drivers from the cabinet above 100Hz by floating them on silicone o-rings. Three separate ones are used to decouple each of the two dome drivers from the enclosure and from the tapered tube absorbers. 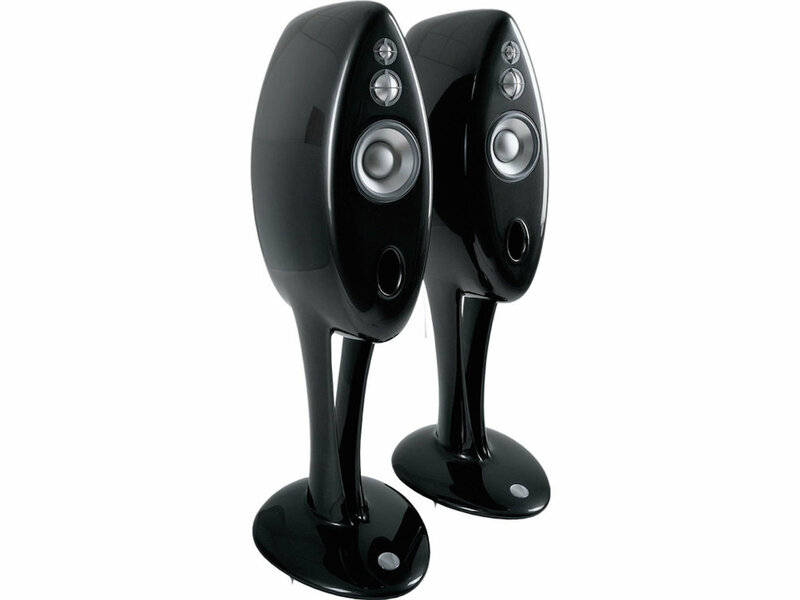 So in the same way as the B1 has bass drivers front and back it also has a pair of reaction cancelling ports”. It’s not just the novel cabinetry and the clever way the drivers are mounted which deserves attention though, but the fact that all three transducers are ‘material matched’, using a magnesium/aluminium alloy, and the tweeter and midrange driver share a similar dome profile to give true phase coherence. Laurence takes up the story, “actually there’s very little to choose from between aluminium, magnesium and titanium in terms of density to modulus ratio, but in the end I chose 5052 aluminium/magnesium alloy because of many reports from the pro field that titanium never sounds so sweet, but this might be an effect which is only noticeable in large compression drivers. Through the use of finite element analysis, an optimised dome/cone combination was found for the lower frequencies. This was supported by a chassis featuring an extremely open design which minimises interference with the rear cone output. Last but not least was the crossover. Although the first prototypes were made by hand using polypropylene capacitors and hand wound inductors hard wired onto drilled boards, Laurence told me that “we fully expected to get the production items from one of the well known OEM suppliers. They duly sent samples which did look the part of course. All very well built with their machine wound inductors mounted on professional looking PCBs – except they just didn’t sound the same. So to this day we still hard wire the components and we still wind our own inductors”. The result is a beautifully built and finished loudspeaker costing £10,500 per pair (in Graphite, Oyster, Sahara, Pearl and Copper paint finishes, with additional colours for an additional cost of £615). That distinctive shape is not, as has been reported, based on a Zulu shield, but “is driven by the same logic which gave rise to Nautilus, namely that the baffle should be just the width of the drivers it supports surrounded by a generous fillet. The critical area around the mid and tweeter units is smoothly contoured for the benefit of the emerging sound field. The further you go from the tweeter the more artistic license you have with the design but in the case of B1 the guiding principle was that of symmetry so the bottom of the cabinet mirrors the top as the rear does the front”, Laurence told me. As you’d expect of a loudspeaker with unique and usual drive units in bespoke cabinets the like of which you don’t see anywhere else, the B1 is a distinctive performer. It’s distinctive inasmuch as it doesn’t do what so many other designs at the price do, which is to somehow manage to lose the natural timing, tonality and/or phase coherence of the original recording. Instead, the Vivid brings you largely unknown pleasures – those coming from hearing the music in a ‘direct coupled’ manner. All drivers have their own patina, from Martin Logan electrostatic panels to Lowthers, and the sonic signature of the Vivid B1 is bright and spry. Indeed, to those used to the inevitable squawkery emanating from average plastic drivers of all descriptions (trendy names or not, as the case may be), the Vivid is nothing less than bracing. Rather like walking out on a beautiful bright and crisp winter morning, the music arrives brilliantly lit but with vibrant definition and dazzling colour. Switch to the likes of the similarly priced B&W 801D, and things became more nasal, more quacky, more monochrome, while the Quad 989 seems soft and silky, but as veiled as a smoggy Victorian dusk. Annie Lennox’s breathtaking cover of Don’t Let it Bring You Down showcases the Vivid’s wonderful clarity. Her closed miked vocals were carried with complete immediacy, yet there was utter cohesion; as her voice went up and down the scale, there were no odd phasey artefacts to be heard, and when she went louder there wasn’t so much as a whiff of distortion, harshness or sibilance. Meanwhile, behind those exquisite vocals, the track’s expansive instrumentation pushed things along, the B1 rendering the backing analogue synth glides with complete believability. Hi-hats sparkled like ships in the night, snare drum pan rolls thumped the verse-chorus bridge transition home and gentle backing electric piano twinkled up and down, in and out of the mix. Simply Red’s Fairground proves no less captivating. Through most speakers, you’re simply treated to a long list of what they’re doing wrong as they stumble and fall, trying to keep up with the complex (and slightly dissonant) backing rhythm track. It’s that heavily processed thumping bass drum that does it for your average big box, but the Vivid doesn’t so much as raise an eyebrow in Roger Moore-style repose. It was in complete command of the heavy percussion, deliciously fleet of foot, while Mick Hucknall’s vocal strains were flattered. He sounded creamy smooth, but just as immediate and ‘in the room’ as a very close miked Annie Lennox had. Elsewhere, the house-style piano breaks came over as surprisingly sumptuous for something likely rendered from a mid-nineties digital sampler. For me though, aside from cutting through this dense mix like a hot knife through butter, what impressed me most was the dynamic accenting throughout the choruses. It was plain to hear that the singer was extending himself, using every foot-pound of pressure in his fast emptying lungs. Sit on dynamic transients, the Vivid B1 does not. Skilful though these loudspeakers may be with processed, compressed chart pop, it wasn’t until I moved to the avant-jazz strains of Rain Tree Crow’s Pocket Full of Change that I really became aware of what this speaker can do. The opening percussion came over with the speed and agility of a duelling sword, and a satisfyingly metallic clang. Hi-hats sounded beautifully realistic, with a ‘zing’ that you just don’t hear from any hi-fi speakers very often, and they timed so sublimely too. There’s such little overhang from any of the Avid’s metal drivers that the instruments simply stop when they’re supposed to, rather than entering into a seemingly endless spiral of tiny aftershocks. The result is so much space around instruments in the mix, and also a wonderfully insightful idea of the performers’ most subtle rhythmic nuancing. This compact standmounting loudspeaker proves lightning-fast, beautifully integrated, highly cohesive and musically expressive. The downside is that the B1 does not go down low in the way a similarly sized floorstander does, for example. Its bass is brilliantly articulate and tuneful, but you don’t get an immersive low frequency experience. This aside, the Vivid B1 is virtually flawless, and an incredible all round package for those with small to medium sized rooms. For those who share my own personal sonic proclivities, this has to be truly one of the loudspeaker greats. It cost £10,500 when first launched a decade ago, but still seems great value now.